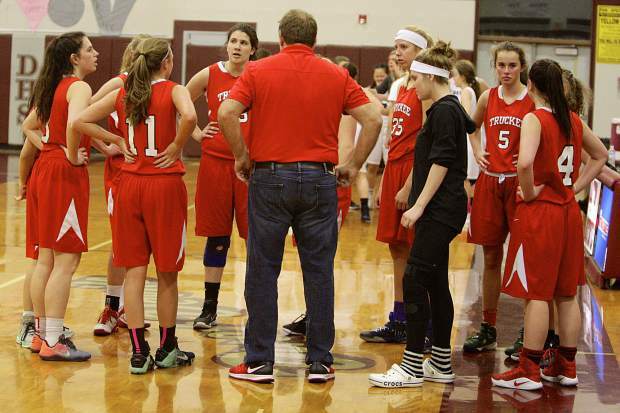 The Truckee girls are show during their road win over Dayton on Feb. 6. The girls suffered a season-ending loss to Spring Creek in the first round of the Class 3A Northern League playoffs. The Truckee girls’ basketball team had their season come to an end on Thursday afternoon, Feb. 15, in Elko, Nev., after suffering a 58-43 loss to Spring Creek in the first round of the Nevada Interscholastic Activities Association Class 3A Northern League playoffs. The Wolverines (11-14, 6-10 Northern League) came in as the sixth seed at the tournament, and fell to the No. 3 seed Spartans (18-9, 11-5 Northern League). After a six-hour ride to Elko, the Wolverines started slowly, falling into a 30-18 hole going into halftime. The team played better in the second half, but it wasn’t enough to overcome the double-digit deficit. The girls got a big afternoon out of junior Ava Seelenfreund, who scored a game-high 18 points. Senior Izzy Abarno closed her career at Truckee with eight points. Sophomore Elena Friedman and freshman Lauren Tanner added seven points each for the team. Friedman was brought up from junior varsity to play in the tournament. The girls saw much improvement during the course of the season, finishing with four more wins than a year ago and making the program’s first playoff appearance since the 2015-16 season. A trio of freshman emerged as leaders on the court, and should keep Truckee in contention within the Class 3A Northern League for seasons to come. One of those freshman, Emma Cooley, led the team in scoring this season at 10.8 points per game, before going down with a torn ACL. Shalvis said Cooley has surgery scheduled and is hopeful to have her back on the court in roughly nine months. Freshman Annika Thayer added 6.1 points per game, ripped down a team-high 7.1 rebounds, and blocked a team-best 1.7 shots per contest. Fellow freshman Lauren Tanner added another 6.0 points per game and led the team with 3.4 steals per game. Seelenfreund, who is one of the state’s best soccer players, came on as a late addition to team, but provided a spark with 9.3 points per game in her 11 appearances. This year’s team was light on upperclassmen, but captain Abarno represented the senior class well with 7.5 points per game. She also dished out a team-high 2.8 assists per game. Truckee will also send off seniors Stephanie Randall, Emma Costa, and Maria Lupita Nicolas. Heading into next season, the Wolverines should be in much better shape. Shalvis said the girls didn’t have much of a training program last summer, but with a squad of several dedicated players, he said he expects to see players in the gym well before the 2018-19 season tips off.